This album follows the struggles, joys, incarceration, and eventual liberation of a queer, Black woman who is punished by a system that seeks to "cleanse" her of all elements in her life that deviate from the norm. She is sent to a prison in which her memories (each of which is a separate music video and an ode to mutual love in rebellion) will be erased. The workers in charge of the erasure, who sit back and enjoy the memories prior to destruction, serve as a sharp metaphor of the white supremacist, cisheteropatriarchal system that is obsessed with Black bodies and creativity while still remaining profoundly anti-Black. This concept album forms a cohesive science fictional narrative, introducing futuristic elements in a way that is rarely seen so explicitly in the medium, opening up new pathways for the musical exploration of feminist science fiction. The accompanying 49-minute short film follows Monáe's character, Jane 57821, as she attempts to break free from the constraints of a totalitarian society which forcibly makes Jane comply with its homophobic beliefs. In the film, Monáe's character is trying to assert her individuality, which makes her the enemy of a soulless regime. Actress Tessa Thompson and actor Jayson Aaron co-star as Zen and Ché respectively, lovers with whom Jane escapes the clutches of this repressive society. The film features little dialogue outside of the overlay of the album's songs which function as the narrative's main driving force. 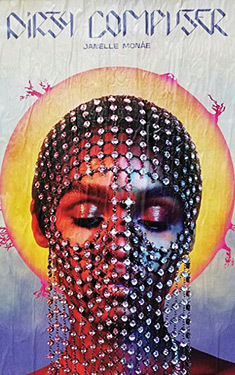 Tim Grierson of Rolling Stone says of the film, "Monáe plays with the conventions and totems of dystopian sci-fi to speak her truth and promote a cultural shift toward a more inclusive and loving society - no matter what repressive government (whether real or fictional) is trying to crush that spirit. Monáe is speaking to the present, but for her, the future is now."